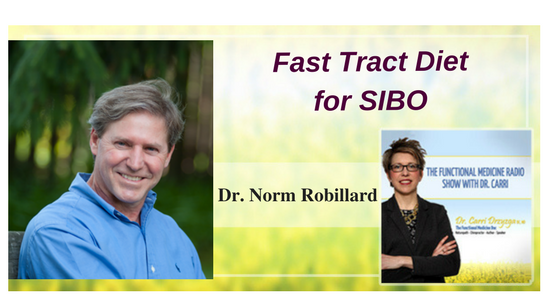 In this episode of The Functional Medicine Radio Show, Dr. Carri’s special guest Dr. Norman Robillard explains the fast tract diet for SIBO. Norm Robillard, Ph.D., Founder of the Digestive Health Institute is a leading gut health expert. He specializes in functional gastrointestinal disorders (i.e. heartburn, acid reflux, GERD, LPR, IBS, etc. ), SIBO and dysbiosis helping his clients transition from drug and antibiotic based treatments to the Fast Tract Diet and other holistic solutions. What is SIBO and why should we care? What are some underlying causes for SIBO? What is carbohydrate intolerance and why is it so critical in SIBO? How can you test for intolerance to carbohydrates? Does the Fast Tract Diet for SIBO suggest that people with SIBO must limit resistant starches until SIBO is resolved? Please explain the differences between diets for SIBO? Humans have a diverse population of about 100 trillion bacteria in the gut, comprising of about a 1000 different species in the large intestine. The gut bacteria turn fiber and other undigested carbs into fats that nourish us. The small intestine develops SIBO when bacteria from our large intestine migrate into our small intestine through the ileocecal valve and grow more than 10 thousand cells per mil. These bacteria also start to scavenge on proteins including the digestive enzymes released by our villi and microvilli. Bacteria in small intestine lead to protein breakdown that further feeds the bacteria to keep growing while the body lacks nutrition. Some dramatic symptoms occur with SIBO – GERD, acid reflux, abdominal pain, cramps, bloating, altered bowel habits, diarrhea, constipation, nausea, dehydration and fatigue. The long term symptoms that occur with SIBO are weight loss, not digesting fats very well, anemia, bone pain, fractures, leaky gut syndrome, which can lead to autoimmune conditions, autoimmune reactions. Due to lack of absorbing nutrients properly in SIBO, there is calcium and magnesium loss, too. SIBO is the cause behind many diseases like IBS, Crohn’s, celiac disease, rosacea, fibromyalgia, chronic fatigue syndrome, and a variety of liver diseases. SIBO is unrecognized but it affects at least half of the population at some point in their lives. It is important to get standardized breath testing for SIBO. People with SIBO have a lower pressure in the ileocecal valve, which makes it hard for the sphincter to stay closed. Causes for SIBO are primarily due to factors that break down the defense mechanism against these bacteria. Standardized testing for gut issues is still a challenge, especially with low stomach acid. Some underlying causes can be traced to motility problems, that could be due to many reasons, like scarring due to Crohn’s disease, surgery, Scleroderma, Hashimoto’s, diabetes, drug use, gastrointestinal infections of E.coli, Shigella, H.pylori. Digestive enzyme deficiency is easily treatable with supplements or eating slowly and chewing well. Using antibiotics reduces our own microbiome, which is meant to protect against SIBO. Malabsorption of carbohydrates with age can also result in SIBO. Breath tests can be done for specific carbohydrates that are suspected to be malabsorbed. The Fast Tract Diet for SIBO does not focus too much on testing but has a 3 pillar approach – limit the amount of all fermentable types of carbohydrates that are hard to digest, like lactose, fructose, sorbitol, xylitol, and mannitol. The large intestine has the microbiome with beneficial bacteria like bifidobacteria, species of clostridia, and bacteroides. Bacteroides fragilis is the most populous and important microbe in our gut. Feeding the body with these resistant starches that are good for microbiome can actually cause problems with SIBO. The five starches must be limited for six months to a year, until SIBO is resolved. Using the mobile app for Fast Tract Diet for SIBO, fermentation potential (FP) can be calculated to feed the microbiome while limiting the resistant starches. The Fast Tract Diet for SIBO is designed especially for SIBO, while others like low carb diet, ketogenic diet, elemental diet, specific carb diet and the low FODMAP diet are not, but are good approaches. Specific Carb Diet designed by Elaine Gottschall limits many fermentable carbohydrates and most starches but not specifically fiber and some forms of fructose-containing sugars like honey and fruit and fruit juices. The low starch diet limits basically starches but not lactose, fructose, fiber or sugar alcohols. Low carb or ketogenic diet doesn’t list fiber or sugar alcohols, but does limit other easier to digest carbohydrates such as glucose. The low FODMAP Diet limits fermentables, the oligo-di-monosaccharides and sugar alcohols, but does not limit resistant starch and includes sucrose and sweets. Paleo diet doesn’t limit resistant starch or fiber, or naturally occurring sugars and sugar alcohols and fructose from fruits, but recommends eating in season which is hard because everything is now available 24/7. Fast Tract Diet for SIBO is the only diet that quantitatively limits all five types of these fermentable carbs and it includes pro-digestion behaviors and practices to optimize digestion to identify and address underlying causes. If you consume starches, stick to the ones that have the low FP values. Limit wheat-based pastas. Rice pastas are lower in points.